(by Emmarie Huetteman and Sabrina Tavernise, NY Times) WASHINGTON — As Congress returned from a seven-week recess on Tuesday, Senate Democrats again stymied a $1.1 billion plan to fight the Zika virus, demanding that Republicans drop an effort to block Planned Parenthood from receiving money to combat the mosquito-borne disease. Republican majority leader Senator Mitch McConnell of Kentucky said that although efforts to fight the virus had produced encouraging results, the problem was far from over. “It’s hard to explain why, despite their own calls for funding, Democrats would block plans to keep women and babies safe from Zika,” Mr. McConnell said before the vote. Because of the standoff, lawmakers say they expect to address the funding issue by the end of the month as part of a must-pass, stopgap spending measure. That legislation would be intended to keep the government funded because it seems increasingly likely that Congress will not pass its annual spending bills by then. But that may not be soon enough, some health experts say. Calls for additional funding gained urgency last week when Dr. Thomas R. Frieden, the head of the Centers for Disease Control and Prevention (CDC), announced that his agency has used almost all of the $222 million it was allocated to fight the virus. He warned that some plans, such as a mosquito control program in hard-hit Puerto Rico, would have to be axed without more money soon. 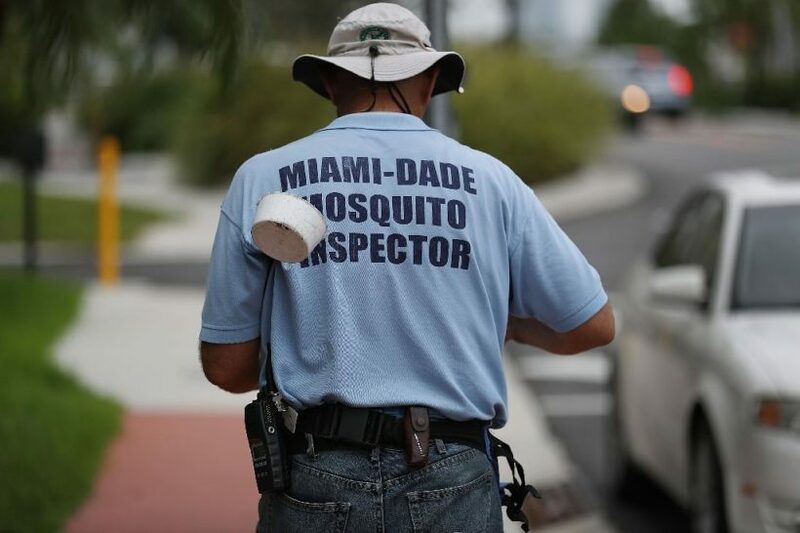 Florida, in particular, has been burning through funds quickly, undertaking the costly work of spraying and otherwise controlling the mosquito population, and health experts worry that another cluster of cases elsewhere might cost more money than they have. The Republican-driven package was supposed to resolve the differences between a bipartisan Senate plan and a less Democrat-friendly House version. The bill would exclude Planned Parenthood from the list of providers that get new funding for contraception to combat spread of the virus, which can be sexually transmitted. Democrats regard any restriction on Planned Parenthood as setting a dangerous example, and they have shown they are willing to risk looking as if they are blocking funding for a public health crisis to prevent that precedent. Democratic minority leader Senator Harry Reid of Nevada said Republicans had sabotaged efforts to address Zika by including the restrictions on Planned Parenthood. “Now with this Zika virus frightening women all over America, they want to cut it off?” Mr. Reid said before the vote. Sylvia Mathews Burwell, the secretary of the Department of Health and Human Services (HHS), said in a briefing last week that the administration was still holding out hope that a bipartisan agreement could be struck, particularly given the growing number of cases in Florida and Puerto Rico. Florida announced seven new Zika cases Tuesday, bringing the total number of homegrown cases in Florida to 56, according to the state Department of Health. Six of the cases surfaced in an area in Miami Beach where the infection is circulating, the department said, and one elsewhere in Miami-Dade County. Published September 7 at NYTimes. Reprinted here for educational purposes only. May not be reproduced on other websites without permission from The New York Times. Visit the website at nytimes .com. NOTE: The 2014 elections gave the Republicans control of the Senate (and control of both houses of Congress) for the first time since the 109th Congress [2005-2007]. With 247 [of the 435] seats in the House of Representatives and 54 seats in the Senate, this Congress began with the largest Republican majority since the 71st Congress of 1929–1931. 2. Why did Democrats block the emergency funding bill? 3. Who is Mitch McConnell? How did he respond to the Democrats decision to block the emergency spending bill for Zika? 4. How did the head of the CDC and the secretary of the HHS react to the Democrats blocking of the bill? 5. What specifically would the funding bill blocked by Democrats do? 6. Who is Harry Reid? What accusation did he make about Republicans? a) How does this explanation of what the Republicans included in the spending measure regarding Planned Parenthood differ from the Times article? b) With whom do you agree: Senate Democrats or Republicans? Explain your answer. What revelation about Planned Parenthood last year is the reason Republicans don’t want additional funding to go to Planned Parenthood? The Democratic leadership blocked it because the bill does not specifically earmark a portion of funding for Planned Parenthood. While most of the funding outlined in the bill would go to mosquito prevention and vaccine research, a small segment is dedicated to public-health efforts. According to Don Stewart, deputy chief of staff for Senate majority leader Mitch McConnell, Senate Democrats chose to block the entire bill because none of this small portion was earmarked for Planned Parenthood. Democrat leader Harry Reid claimed that women would have nowhere to go to obtain birth control under the bill, but, in fact, nothing in the legislation would cut any federal funding currently going to Planned Parenthood. It simply does not add more funding in the context of treating Zika. Planned Parenthood’s executive director, Dawn Laguens, spoke alongside Reid and Schumer, implying that it is more important for Planned Parenthood to receive direct funding under the bill than it is to pass a bill quickly.